A frantic rescue operation was underway on Tuesday in front of the Indonesian island of Sulawesi in search of dozens of passengers. At least 12 people were killed and a frantic rescue operation was underway on Tuesday in front of the Indonesian island of Sulawesi in search of dozens of passengers from a sinking ferry and was beached by its captain in a desperate attempt to save lives. The latest in a succession of boat tragedies in Indonesia comes on the same day that authorities suspended the search for 164 missing people when a wooden ferry sank last week in a deep volcanic lake on the island of Sumatra. South Sulawesi provincial police spokesman Dicky Sondani said the Lestari Maju ferry was about 200 meters from the shore. He carried 139 passengers, according to his manifesto, in addition to vehicles. 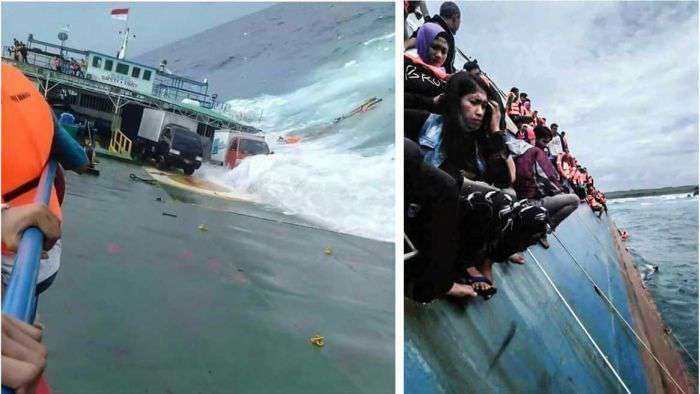 Photos distributed by the National Disaster Agency showed passengers clinging to the heeled boat while others descended into the rough sea using ropes hung over the rail. Most seemed to be wearing life jackets. The agency said 12 people had died, including two children aged 2 and 3 years. Sondani said the captain steered the 48.5-meter-long vessel to the shore once it began to sink during a trip from Bira port to Selayar Island, south of the main island of Sulawesi. The general director of maritime transport Agus Purnomo said in a statement that the actions of the captain helped the rescue tasks. More than 30 people have been rescued and eight of them were being treated in a hospital, said Selayar district chief Basli Ali. “We are still trying to rescue the passengers with the help of the police, the army and the search and rescue agency, as well as local residents,” Ali said. Ferry tragedies are common in Indonesia, an archipelago of more than 17,000 islands with a history of poor implementation of safety regulations. The LagoToba disaster was the worst in a decade.